Full Stats for 4A-16 can be found on the 4A-16 Stats Page! Overview – Every once in a while a district comes together to generate multiple contenders, and this year 4A-16 has been one of those examples. Both Key West and Gulliver Prep are capable of making a run for a state title, which also means either one could garner a district crown along that path. Upsets are a great part of playoff baseball, so it would be unfair to disregard the capability of the other three teams in this bracket, but after the way the favorites have played it is equally unfair not to recognize their great potential to make a deep and special playoff run. It is a bracket that should provide plenty of excitement for all the fans in attendance. 1. Key West – The Conchs dominate the Florida record books. The school has won more state titles than every other program in the state and is among the all-time leaders in tournament appearances and tournament games played. Key West has won 11 state titles, the last of which came in 2005. This year Key West celebrated the 30th anniversary of their 1984 championship program, and the celebration was amped up by the buzz and excitement that the current group has created through its play this season. It has been a banner year for the talented team down in the nation’s southernmost city. 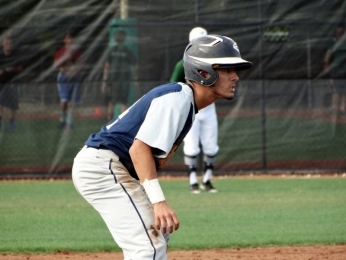 The team has played great baseball in all three facets of the game, has beaten some of the best around the area and also around the country, and has given all of its passionate fans plenty of reason for excitement heading into the 2014 postseason. Now the Conchs are gearing up to make a run for their fourth Class 4A state title. Pitching has been the key ingredient for the club, as they have thrown the ball with authority to stay in every game all year long. 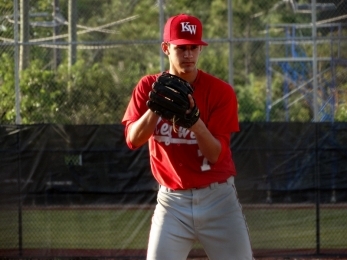 Sophomore Greg Veliz has been a major part of their success, finishing as one of the top pitchers in South Florida while also being among the team leaders on the offensive side of things. Jay Pressley and Jay Feathers have emerged as solid starters that provide the team with the sort of depth it will need, while relievers Hunter Sellers, Damon Taylor and Hunter Matheessen has excelled at holding the line and turning things over to stellar closer Steven Wells. The Conchs have been equally potent on the offensive side of the ball, batting around .350 for the season and showcasing a lineup in which nearly every starter hit .300 or better. Wells was also among the team leaders in most hitting categories, while Darren Miller, Andy Perez and Hugo Valdes have been reliable producers too. The way the team has played this season, there is no question that they have faith and confidence in whoever is at the plate in a big moment, as the lineup has proven it can come through from one to nine. History is also on the Conchs’ side. It is a program with a great and supportive fan base, one that travels well to root on their club. After the way this team has played this season, it just may be that those fans will get a chance to travel all the way to Fort Myers when it is all said and done. 2. 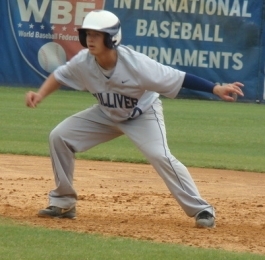 Gulliver Prep – Even before shortstop Joseph Dunand blew up the internet by putting on a home run clinic during a Spring Break tournament in Arizona, the Raiders were doing more than enough to garner their fair share of attention and recognition. After the program fell short in the regional quarterfinals a season ago, it pledged to right the ship and rebound back to prominence in 2014. Manager Javy Rodriguez challenged his players to rise to their truest potential, and this year the guys have responded to do just that. This season the players have backed that guarantee. After he hit nine home runs in a five-game span over Spring Break, Dunand leaped to the top of the home run leaderboard in Miami-Dade County. But he is not the only power hitter on the squad, as the team has belted more than 20 home runs this season. As impressive as Dunand’s season has been, it is actually Oscar Marchena who led the club in total hits and batting average. Both players scored over 30 runs each, and teammates Brent Diaz and Gio Soto specialized at driving runners in. Brian Nido was also a key player in the lineup, hitting for average and scoring around 20 runs on the year. Not to be lost within the excitement of watching the balls sprayed all over the yard is the fact that Gulliver has pitched very well all season long. Michael Gonzalez and Davis Brown both excelled to provide the team with great depth at the front end of the rotation, while German Marcos has provided a great third option which could prove to be huge should for the team to make a deep playoff run. The bullpen has also been very reliable, where Palmer Phillips, Aidan Khal, Rob Touron and Jonthan Perez have all logged big innings in relief throughout the year. All the pieces are in place for the Raiders to contend for both a district title and beyond. The club closed out the season strong, winning 11 of its final 12 games. Gulliver played a tight and competitive contest in its meeting with Keys Gate Charter this season, but has really begun to click since that time. Now the club hopes that momentum will provide them with the right formula to make a deep run this postseason. 3. Keys Gate Charter – It has already been an exciting season for the Knights. The program has come a long way over the last few years, and 2014 marked its first time competing in a district. With a roster that will graduate just three seniors, the program knows they have a bright future ahead of them. But right now it is about enjoying this next special step in their evolution. Keys Gate will compete in their first district tournament this postseason, and it is just one win away from advancing to their first district championship and first regional playoff berth. While it is a very tall order to try and get past a deep and dangerous Gulliver squad, the excitement generated on their side of the field should serve as plenty of extra motivation to lay it all on the line. Any young team getting its feet wet for the first time in the playoffs is going to be a big underdog in that game. Yet while the Knights know they are up against a huge challenge, this factor should serve in their favor to help them play loose and relaxed. The team is not expected to win just yet, and with no pressure on their side the players should be able embrace the moment with the right mind frame. It is a young group of producers who has carried the club this season. Sophomore Alan Quezada has been the main hitter in the lineup, batting over .300 while leading the club in hits, and fellow sophomore Matthew Garcia has led the team in RBIs and extra-base hits. With so many guys still finding their swings at the varsity level, the club has worked with a small-ball approach to manufacture runs and make the most of their scoring opportunities. The pitching staff is also very young and promising, but has also been able to lean on two veterans to provide leadership and set the tone on the mound. Seniors Emmanuel Padron and Kyle Roberts have tallied the majority of the innings on the mound this season. Now the club is hoping the pair can give them their biggest outings of the year to help keep them in the game and give them a shot at the huge upset. No matter what happens, the Knights are excited just for this moment to arrive. Every team has to start somewhere, and the chance to get their feet wet against such a quality Raiders opponent will only work to aid them in their evolution going forward. 4. Coral Shores – Lost among the buzz that has been generated by some of the other teams in the district is the fact that the Hurricanes have quietly put together a solid campaign this year. Coral Shores finished with a winning record this year and played their district tough, especially their quarterfinal foes Ransom Everglades. In sweeping both meeting this year the club proved it can beat the Raiders, and the first step towards the district championship is to complete the hat-trick and beat them one more time. Although only one of the two meetings counted against the district standings, the Hurricanes got the chance to see Ransom’s best two times. The team threw each of their top two pitchers against them, which gives both Will Goodwin and Jose Lima a chance to develop a personal scouting report to work off of now that the most important meeting of the series has arrived. This same theory holds true for the rest of the pitching staff, especially after Ransom made a late rally and nearly came back for the win in their second meeting. Goodwin and Lima have combined to provide a formidable one-two punch at the front of the rotation this year. The pair logged the majority of the innings on the mound, finding equal success to go neck-and-neck as the statistical leaders in most pitching categories. This depth in the rotation also provides them with just enough pitching to keep them alive during a playoff stretch. The offense has also proven more than capable of slugging its way past anyone. The team batted just over .300 as a unit and averaged over five runs per game, and for the Hurricanes to make a run they will need to continue to hit the way they have all year long. Dalton Falcucci, Fernando Garcia and Daryl Chou have been the key cogs in the offensive machine. The two led the club in hits, on-base percentage and runs scored. Their ability to get on base and then get in has been pivotal in leading them to victories. Lima has been the guy to provide the most power in the order, leading the lineup in RBIs while connecting for the only home run on the club. Coral Shores will need to put it all together if it is going to make a run to the finals, as that road would have to include an upset over county rival Key West. If the Hurricanes take care of business against Ransom Everglades, they may be able to generate just enough momentum to give them that chance. 5. Ransom Everglades – The Raiders can take some great motivation in knowing they are capable of going toe-to-toe with Coral Shores. The club has the toughest road to reach the district championship, needing to pull off two upsets just to reach the title game. Yet while it has been a struggle this season, Ransom should have some confidence in knowing their best performance of the season came in their district match up with the Hurricanes in late February. 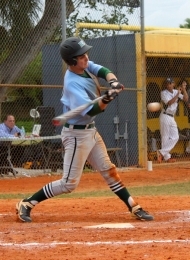 The two clubs battled back and forth, before Coral Shores pulled away with the win late in that ball game. Offense will be crucial for the Raiders, as their young pitching staff has struggled this year. The team’s best chance at getting a few upsets will be at the plate, where such a scenario would very likely require them to slug their way to a high-scoring victory. Ransom has proven it can swing the bats well enough to do just that. The batting order does not showcase a ton of power, but it executes well moving runners station to station and moving them across the plate. Junior third-year starter David Lanster has been the key piece to the offensive puzzle, just as he has been for the last two years. Lanster led the team in batting and runs scored, and also showcased his great speed by swiping over 30 bases this season. Caleb Bush and Matthew Heisenbottle were also key in getting on base and scoring, while Chris Rossi and Ricky Suarez played their roles by driving runners in. There is no question that the Raiders faced their share of growing pains this year. Yet down the stretch the club played its best and most competitive baseball, staying in every game it played from its Spring Break tournament right through to its conference tournament. Now the club is hoping that experience will provide them with the ability to make the final adjustments the Raiders will need in order to extend their season and make a playoff run.